It's a holiday miracle! OK, maybe not a miracle, but folks have been working hard on Visual Studio 2010 Service Pack 1. The BETA was released today. See how BETA is in RED? That's because it's a beta. Funny thing about beta service packs. They are Service Packs so there are lots of good bug fixes. But it's beta, which means we, Dear Reader, are not sure if they've missed some. It's beta software, so be careful. Back things up, maybe take a disk image. There is a go-live license, which means you can use this software today and use it in production. Upgrading from SP1 Beta to SP1 "final" will be one step. If you hate betas, feel overwhelmed, don't like being on the cutting edge and don't want obscure details, stop reading now and go here. Here's the curent Visual Studio 2010 SP1 Beta README file. Be aware that Microsoft is in the middle of a lot of Beta Releases. It's your choice to play now or wait. First, MOST of this beta stuff works together just fine. You may have seen my PDC talk where I used all of this together to build an application. There may be some bugs, so If you need things to not break at all, then just wait a month or two for all this Beta to calm down. For example, the new "Async CTP" isn't compatible with the web tooling. Some folks have asked, "When will the beta releases be over and I can start working with final code?" ASP.NET MVC 3, WebMatrix, IIS Express, SQL Compact Edition 4 and more will all be released in mid-January. Visual Studio 2010 Service Pack 1 will finalize a few months later. Use VS2010 today and come spring you'll have some new improvements that will build on VS2010 and make coding more enjoyable. They'll all work together. That said, if you have a little patience, I encourage you to check out Visual Studio 2010 SP1 Beta. There's LOTS of great fixes, updated features and new tooling. Here's a sense of what's updated. We'll get a more complete (meaning "official") list nearer to release. This list isn't complete. I'm working on getting a complete list. In addition to fixes for bugs and things reported via Microsoft Connect, there's also these updates to Visual Studio 2010. Project Properties has been updated. Note the choices for IIS Express, Visual Studio Development Server, etc. Here we're able to add a New Virtual Directory from within Visual Studio. Note, SP1 does *not* include IIS Express, you need to download and install it separately. IIS 7.5 Express Beta 3 can be installed using Web PI 3.0 via the UX or directly via this direct link. Note that you don't need WebMatrix to get IIS Express now (win!). I've blogged about EF Code First ("Entity Framework Magic Unicorn") before, which released a CTP5 today. I've also talked about SQL Compact Edition 4, a tiny xcopyable file based SQL Server. I showed them all working together in my PDC talk PDC10: Building a Blog with Microsoft "Unnamed Package of Web Love"
In that talk, I was able to open SQL Compact Edition 4 database files directly in Visual Studio. Internally we call that "SQL Compact Edition Tooling." Microsoft folks often refer to the Runtime and the Tooling separately. Here's the SQL Compact Edition 4 Tools for VS2010 SP1 Beta that I used in my PDC talk. Additionally Web Deploy v2 is coming, and will allow you to easily migrate SQL Compact 4 to SQL Server directly when you outgrow the former. You can install both of them directly from the Web Platform Installer 3.0. Go here to install Web PI 3, shut it down, then run it again from the Start Menu and select the things you want. Silverlight 4 Tools for Visual Studio 2010 plus RIA Services is now included in the box along with Silverlight 3 support. Unit Testing on .NET 3.5 – Today all unit tests are run under .NET 4. While acceptable for most users because of the compatibility done in .NET 4, this caused problems for some of you with .NET 3.5-specific dependencies. IntelliTrace F5 for 64 bit and SharePoint projects – This is awesome for me as I needed IntelliTrace on x64 literally yesterday. 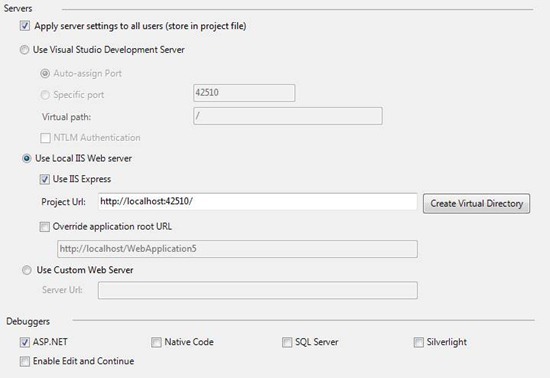 Performance Wizard for Silverlight – Now you can use the profiling tools on Silverlight apps as well. VB Compiler runtime switch – This switch will enable Visual Basic developers to target their apps and libraries at platforms where the full VB Runtime hasn’t traditionally been available. Should be a win for VB on phone, XNA, etc. Keep using Visual Studio 2010 and feel no pressure to install a beta anything. There's lots of great stuff in VS2010 to explore. If you install VS2010 SP1 beta, don't uninstall it if you can avoid it. Rather, wait for SP1 final which will upgrade your beta cleanly and leave you in the best state. If you want to see the update wave of Web Tools and get some beta bug fixes, install the SP1 Beta and report bugs. If you're using SQL Compact, check out their tools as well. If you aren't installing the beta tools today, then relax, and install the final web tools stuff in the January then VS2010 SP1 later in spring. When it's all released, you'll be able to install all this as one package from Web Platform Installer. 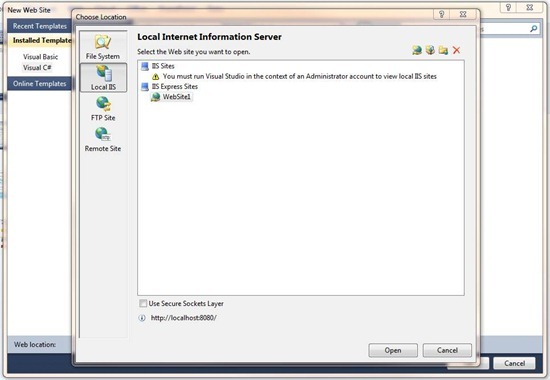 You'll run Web PI, select Visual Studio 2010 SP1, then install. Random Community Wallpapers because they are fun. Nyah. Are apps built with the beta installed backwards compatible with .net 4 RTM? In other words, if I install the beta, rebuild my apps, and ship to customers using the go-live license, will my app still work even if they haven't installed .net 4 SP1 beta? Oh, and another thing: I'm sure many of the fixes etc have either a MS connect item or MSKB article describing the bug/change/fix in more detail. Would it be possible for you to extract and publish that? E.g. a list of all VS and .net connect items that has been marked as 'fixed' between the .net FX RTM build and the day the SP1 beta was built...? Kristofer - Yes, totally. You can build an app with SP1 Beta installed and deploy to a non-beta machine if you like. And yes, I'm looking for a complete database dump of Connect Bugs that's correlated with bugs fixed. I want it too. It's out there, I just need to find the right people. Why only "*initial* support for HTML5"? Isn't it based on this HTML 5 Intellisense for Visual Studio 2010 and 2008 tool, made by Mikhail Arkhipov from Microsoft? I guess they haven´t got the data-* attributes to work yet because of limitations in how the XML for Intellisense works. You can also embed SVG in a HTML5 document, which would need full support for the SVG specification. Honestly, my biggest pet peeve is the loss of color printing in VS2010. Is that possibly fixed? If you have “ASP.NET MVC 3 RC” installed, please be aware that installing Visual Studio 2010 SP1 Beta will break Razor IntelliSense. There will be a new “ASP.NET MVC 3 RC2” installer released next Monday that you can upgrade to in-place. If you’ve already installed Visual Studio 2010 SP1 Beta, don’t uninstall the Beta Service Pack, just wait until Monday and upgrade your MVC installation. Scott, you mention "SQL Server Compact Edition 4 Beta"... I had only heard about the CTP1 version. Is there a place to download just the beta version for SQL CE4 ? I made the rounds in the search engines and could not find mention or a link to download the beta for CE. I ask for a download link because we have a VS2008 project that uses teh CE4 CTP1, and would like to use a more stable version for that if possible. Thanks! @Gabrial Right now, the latest version of SQLCE4 on WebPI is CTP2 (runtime and VS tooling, both released Oct 15). There's also new tooling for VS2010 SP1 (released Dec 9). You said beta 37 times in one post that has to be a record. @Lucas: Thanks for the info. My project has nothing to do with the web, so it never occurred to me to look into the web platform installer for new versions of SQL CE 4. Thanks! your Very Very Soon it is not sooooo soon i've alredy clicked at least 10 times on that link and still off for me lol. Nice to see that .Net 3.5 is supported for unittests. Have had some issues with that trying to use some SharePoint components in my tests. Looks like "Very, Very Soon" is now. The link appears to be active and I just downloaded the setup. Now to see if I get my intellisense back for Razor. Great write up on this post and all your other posts. They have been "Very, Very helpful". Daniel - It's initial because it has a few known gaps which we've already plugged for a future version. It's much better than Mikhail's extension though. The things it doesn't do are pretty obscure and not widely used. Does this mean the nightmare of "uninstalling everything" goes away forever? "If you install VS2010 SP1 beta, don't uninstall it if you can avoid it. Rather, wait for SP1 final which will upgrade your beta cleanly and leave you in the best state." 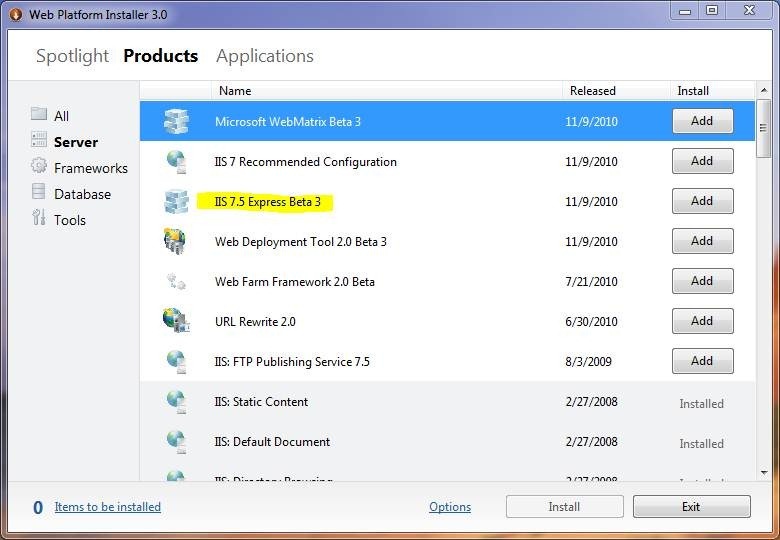 Is there way how to download IIS 7.5 Express Beta 3 without Platform installer? This looks like the DIRECT link to the IIS 7.5 Express BETA installer. Got it during the Web PI installation. I faced this issue a month before,but now it get resolved. This is very useful guide. I became a fan of it. I will read it regularly and suggest to my friends also. Thanks for this tips. Now iam very confidence in visual studio and very happy that .Net 3.5 is supported for unittests. Keep it up and post more and more in visual studio. I know you are an ASP.NET man(!) - is there a way to add a SQL Server Compact 4 database to a WPF app via C# 2010 Express? Perhaps I should have unistalled Compact 3.5 first (the option's not appearing in the data source config wizard)? Thank you in advance. Can I please ask where is the SQL Server 4 Compact Beta download? Looks like the version I have is CTP1 which I most probably should have uninstalled first. So far, this has fixed my crashing issues! No more having to redo all of my GUI settings, lose the open files I was working on, or deal with the crash reports. Thankfully, Windows 7 even recommended the fix. So what you're saying is that this is a beta in the traditional sense, not the Google "perpetual beta because we're cool" sense. Very happy to hear the news that Visual Studio Explosion! 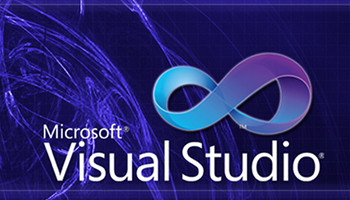 - VS2010 SP1 BETA version has been released. Some of the new features are: Web Bug Fixes, HTML5 Schema Support, IIS Express Support,SQL Compact Edition 4 Tooling and Additional Good Stuff etc.... and the conclusion (Simple Conclusion in Context) you have given also very impressive. Good effort by this team and thanks for that. All these new features sound cool but I hope something is being done to address the pathetic perfomance of VS2010 with a moderately large Silverlight project. I have an I7 quad processer with 6G of Ram. WE had to turn off the XAML designer as it is so SLOWWWWWW! Even then the XAML takes 5-10 seconds to load and this occurs more than once before VS2010 decides the user can input something. I observe moderate (30%) CPU utilzation and only 3G (of 6) Ram being used .To me new features are secondary to this issue as we are wasting way to much time looking at a WAIT cursor. Css intellisense not worked by CTRL + space after disabling them in settings as documentation show that. means you can use intellisense by pressing CTRL + space even you disable them using settings. When i write this in Microsoft connect they tell me that they solve this in next release but i not found the solution in SP1. are i am wrong then tell me the way ? Still no intellisense for C++/CLI .. still a complete failure.